“All in one” flashlights are great, but most are cheap plastic and meant to be stashed in an indoor closet somewhere and pulled out during a hurricane. The Goal Zero is rugged and meant to be in your EDC bag. It can charge through USB cable, crank, or solar panels- never leaving you without a light. Personal protection is an area where low tech usually works. Bear mace, knives, guns- all of these options have been around for a long time and work very well. This alarm is no substitute for any of these, but provides it’s own expanded usefulness. At 120 dB, it can be heard for miles in the right conditions. Besides its usefulness for personal protection, it is great if you get lost or need to get attention for another reason. Everyone knows how useful headlamps can be, and these are headlamps for your shoes! Yes, we admit they are more than slightly absurd, but they are useful. Light sources that keep your hands free are always great additions. The more severe an emergency is, the less likely cell phones will be working. Sending a text is the best way to get through a message with a cell phone in an emergency, but most of the world’s infrastructure will be relying on satellite phones to maintain communication. While HAM radios also provide another means of communication, satellite phones are the creme of the crop that are mostly immune to earthbound disasters. Sure, an EMP, CME, or other disaster could take them out of the picture- but these disasters are less likely. Only 2.5% of the water on the planet is freshwater. Only 1% of the freshwater is accessible- the rest is trapped in snowfields and glaciers. If you leave near an ocean or salt lake, a water desalinator can be a big difference maker. A desalinator can turn one of these into a huge water resource. Security should almost always be at the top of your priority list. Fortress has a highly rated line of DIY security systems that are versatile enough for any home. You can pick up options for motion sensing, strobes, alarms, and auto-dialing. They take a few hours to install, a little wiring experience and cordless drill. This geiger counter has a user friendly interface and is versatile enough to be able to detect Beta, Gamma, and X-Ray radiation. It has a setting to turn into a dosimeter as well, which makes it great for going through known contaminated areas without risking overexposure. Picking one up even just to check background radiation in your area is worth it- there are often surprising results in natural variation. This dehydrator can drastically increase the shelf life of your fruit, vegetables, and meat. Not to mention dehydrated food, like jerky, is great tasting. 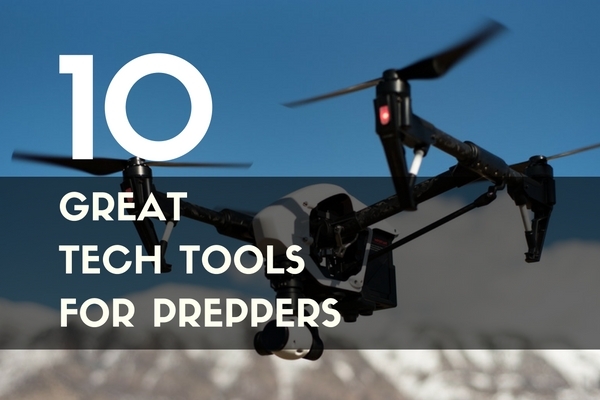 Whether you are looking for a new hobby or want to mix up your options for food storage, this tech tool comes in handy for any prepper. A smartphone is a great tech tool for a prepper. A dead smartphone is not. If you do not have a charger in your vehicle, consider getting a power inverter instead. You can use it to not only charge your phone, but run other electronics designed for home use from your vehicle. The one we listed handles 300 Watts and a 700 Watt peak, so there are only a few small appliances it will not handle. While a quadcopter may not be for everyone, it can be a very useful tool. They make them very easy to pilot with self leveling technology. With the attached cameras, you can survey large areas. Whether you are snowed in, have trees blocking you in from a hurricane, or any other situation- your drone can get out. Even the lesser expensive drones are useful, although you need to maintain line-of-sight and watch recorded video instead of real time. If you know somebody with a quadcopter, ask to try it out and see how easy they are to maneuver- you may be surprised. Do you have any other cutting edge devices that are worthy of adding to the list? 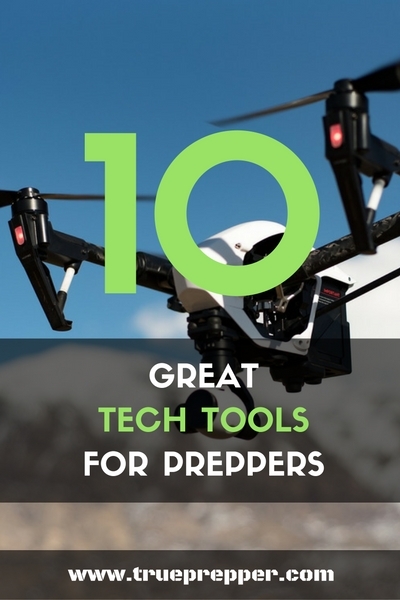 Leave a comment below if you know of any great tech devices for preppers! Keep exploring, stay prepared, and be safe.